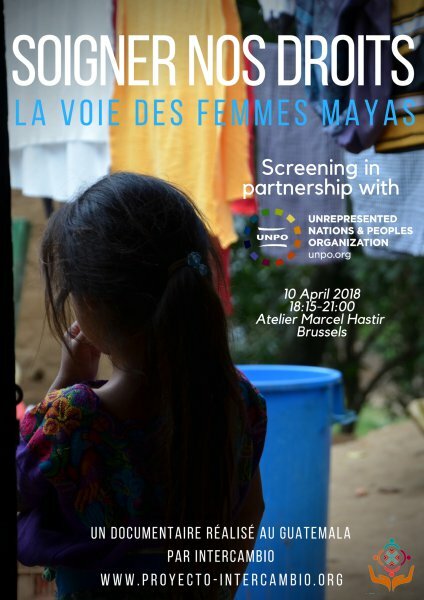 UNPO, in collaboration with association InterCambio, will be screening documentary "Maya in Action - Narratives of resilience in Guatemala"/“Soigner nos droits - La voie des femmes mayas” at Atelier Marcel Hastir in Brussels on 10 April 2018. This event will begin with opening remarks from InterCambio and the movie will then be screened in its original version. The screening will be followed by interventions from several panelists and a moment of discussion between the speakers and the audience. The documentary, produced by association InterCambio, presents a humane and understanding perspective on Maya women's lives in rural areas of Guatemala, as well as on the discriminations they face in accessing health services. The protagonists are women who have decided to struggle for their rights in their own communities, despite numerous obstacles. An oral and visual testimony of the courage of these women, who often fight behind the scenes. The event will be held in English (English subtitles to the documentary). The documentary's trailer is available here (in Spanish with English subtitles) and here (in Spanish with French subtitles). For any questions regarding this event, send an email to j.duval@unpo.org.